Some built-in computer speakers don't go up loud enough to hear a thing, and some of them seem to blow the moment you try to turn up your favorite song. Built-in speakers just aren't reliable. Even the best computer can have faulty speakers. You don't have to settle for poor quality sound. There are external speaker options for all budgets. The thing with buying budget speakers is that if you buy some no-name brand, you may end up with sound no better than your laptop speakers, or you may buy something that sounds even worse. 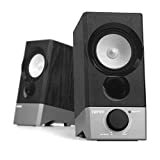 There are so many speaker options out there that it can be hard to figure out which ones are the best to buy, and no one wants to spend the entire day on the internet checking reviews of speakers just to find the right pair. It helps to start with a plan. You need to know what you're looking for in a set of speakers before you shop. Consider size, looks, and sound; make a list of the options you want or need. You wouldn't shop for a new vehicle without considering your needs, would you? Give your speakers that much consideration before you invest even the smallest amount of money. Are You Ready to Invest in the Best PC Speakers? There is a myriad of PC speakers on the market, and it can be difficult to know which ones aren't a complete waste of money. There are some brands out there not worth the cost (often found for sale at discount and dollar stores). 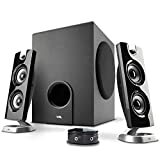 You also need to shop for what you need; look for speakers that are the right size for your desk or room, a quality that will last or something that will get you by, and convenience (like remote controls or special volume adjustments). When it comes to the best PC speakers on the market, no matter what price bracket you're looking at, you need to look at the brand name. Some specific names stand out when you're considering PC accessories of any kind, like Alienware (which is a high-end product) and Logitech. However, there are some good new names on the market to consider. How much space do you have in your office or on your desk for your computer speakers? Space matters when it comes to speakers, and how elaborate a set you want to own matters as well. If you only have a small amount of space you'll want a single speaker, maybe something that's cordless and runs with Bluetooth. If you have a lot of space and need a lot of sound, you'll want something that comes with dual speakers and a subwoofer as well. Features can include anything from having Bluetooth capabilities or the ability to attach an auxiliary cord for extra uses (like hooking it up to your stereo or iPod) to having extra sound controls. If you want to be in charge of the bass and treble on your PC speakers, you need to look for speakers that offer it. You might want speakers that can work with more than just your computer. Consider all of the uses you intend for your speakers before settling on which ones you intend to buy. Not all PC speakers work with smartphones, tablets, TVs, and gaming systems. While this list is focusing on bargain-priced speakers, under $50, you need to consider the amount of money you want to invest in speakers before you start shopping. You can spend single digit dollars up to hundreds of dollars on speakers. Consider the types of bells and whistles you need for whatever purpose your speakers are serving. If the product has any problems, we accept return or exchange new speakers anytimes. If brand name recognition doesn't mean anything to you and you want an affordable speaker that looks cool, the DMZER USB Powered Light PC Speaker is for you. It's an extreme budget. 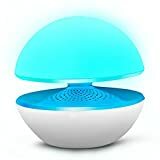 This speaker has a cool shape, lights up, and works great. If you're jamming to your favorite tunes, it's probably not the right option for you though as you’d need better sound. The DMZER is a good general speaker that works well and plugs in through one of your computers USB ports for power and into the headphone jack. Logitech is a common name in the PC world. When you're shopping for a new mouse, keyboard, or speakers, Logitech has something to offer at varying price points. They are a go-to brand for many PC users, from laptop to desktop accessories. 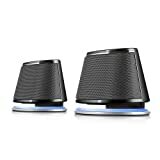 The Logitech Speaker System Z323 with Subwoofer is an ideal choice for music lovers and people that like to watch movies and TV streaming on their PCs. While this collection isn't easily portable, and it doesn't take up a small amount of space, all three pieces are slender so that they won't fill up your entire computer desk. If you're looking for fun speakers for all of your laptop and PC needs, these Satechi speakers have it. They have a fun look, and even have some LED lights to add a little flash to the look. This duo speaker set runs on USB power and offers in-line volume control. It also offers Acoustic Air Spring technology, so you get the best sound possible. If you want the most compact of speakers that still offer you excellent sound quality in a bar speaker. Of the best PC speakers out there at bargain prices, this is one of the most elegant and space-saving choices. 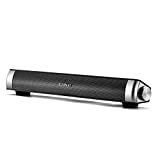 The Elegiant USB Powered Sound Bar Speaker hooks up easily to many of your devices, from laptops to smartphones and more (with direct hookup, no Bluetooth). Compatibility amongst devices at a low cost is a bonus when it comes to speaker shopping. The Cyber Acoustics CA-3602FFP 2.1 Speaker Sound System with Subwoofer and Control Pod is a great speaker system at a great price. For just $ you can get a sound system for your computer or gaming system. One of the coolest features this system offers in the control pod. The control pod is almost like a remote control, but it's wired to the speakers. It offers volume control, power control, and even has a headphone jack. 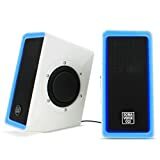 Gogroove offers an excellent pair of PC USB powered speakers that will make your friends jealous. These speakers look awesome. They offer 3.5mm AUX Input, 2.0 channel dual passive bass woofers, and a built-in volume dial. These fashionable white speakers are perfect for your PC or desktop computer, or even your gaming system. The LED lights on these speakers make them even cooler and add a nice effect at night while you're enjoying some relaxing grooves. The lights have their own easy to use switch. The subwoofers are attached to the speakers themselves, which helps you save tons of space. Here's another great set of Logitech speakers to consider. This set is even cheaper, but still well worth owning at under $. The Logitech S150 USB Speakers offer digital sound, which gives you great acoustic sound. 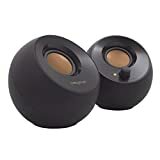 Logitech users love these speakers since they offer a great product at an extremely discounted price. They're also a convenient size and won't take up too much space on your desktop. This set of Logitech speakers might not have all the bells and whistles of some of the other speakers on this list, but they offer great sound nonetheless. If you're partial to having a headphone jack and you don't mind speakers that take up a little more space on your desk, this set of Logitech speakers might be a better choice for $. One of the most interesting, and somewhat unique, features in this set of speakers is that you can have two devices hooked up at the same time. They offer sound clarity that's hard to beat at such a low cost. You can turn these speakers up for a lot of sound if you like it loud - and not have to worry about distortion. The USB powered Edifier R19U speakers have some limitations when it comes to bass and volume control, but they're still a great choice for compact desktop speakers at a bargain price. These may not be the best option for $, but they aren't the worst either. If you need speakers for general purposes and you're not worried about theater surround sound quality, these are a great choice. Comes with a 3.5 mm auxiliary cable that allows you to hook up your iPod, stereo, gaming systems and more. It is a versatile option when it comes to uses. If you want some stylish and fun speakers, the Creative Pebble has something unique that will give your office desk a zen-like feel and look. You get a pair of these powerful little portable speakers for $. They offer amazing sound. The company was inspired by Zen rock gardens when they created these speakers, so they will give you peace and tranquility in your home. It won't matter whether you're using them to do a guided meditation or to listen to the newest top 40 song. With this overview of some of the best PC speakers on the market that are available at affordable prices, it's time to pick the set that works for your individual needs. Don't forget to shop around for the best prices, which aren't always on Amazon; there are other affordable shopping options. Don't suffer through the poor quality of your built-in PC or laptop speakers, get something better! Idelina is an American-Mexican middle school music teacher with a penchant for gardening and growing her own vegetables as much as possible. Idelinadevours short and long reads on topics of health and exercise, but she’s also fond of the occasional cocktail or two.